When Spike accidentally invites Princess Ember and Thorax to Ponyville on the same day, he believes they won't get along and tries to keep them apart. The episode aired Saturday 11:30 AM EST on August 19th!! This thread is dedicated to discussing the episode before, during, and afterwards. As the thread is now open it may indeed contain spoilers. I ask that potential spoilers talked about or shown before the episode airs stay within the spoiler tags please, after the episode you no longer have to use the spoiler tags, but warning, if you haven't seen the episode yet after it airs, this thread no doubt will have all sorts of spoilers in reviews, images, etc. So tread at your own risk! As some of you might have seen on my personal blog, I have yet another rp ideal rushing around in my head. Here is the premises: The day had started just like any other, the denizens of Ponyville have begun their day just like they always do. Starting up the shops, going to school, making and going through with their plans, and hanging out with their friends. Twilight had begun her day as well with a new spell book, and a new project. Of course, Spike was by her side and aiding her with the project. When she revealed that she learned the spell to see into other dimensions ever since her experience with the mirror. Spike wasn't so sure about this at first, but that didn't make him stop helping his friend. It wasn't till Twilight placed in the last ingredient and cast the spell that something strange happened. A bright glow on the wood floor began to rise up, encasing the entire house in a bright white, then quickly changed into a dark blue. It was then that the blue changed into a surreal image of what seemed to be just between Canterlot and Ponyville, except there seemed to be a lot of differences from what the two were use to. They saw big, round, flying crafts in the air. Two in particular were the biggest out of the rest, having the names on each one; Luna and Celestia. The spell didn't last long and the image went away, but not before they saw their friends dressed in strange and interesting clothing. Twilight was utterly giddy at this discovery, so much so that Spike was beginning to worry that she would go even farther. Night had fallen, sleep had found Twilight and Spike as it did every night; it wasn't till the next morning that something happened. "Wake up, sugarcube." Spike heard as he began to open his eyes, seeing a familiar light orange filly standing over him, yet something was off about her. Instead of the smell of apples coming from her, there was a thick, mucky smell now, like oil. That was when he realized he realized that not only was she different, but so was where he was. He wasn't in Twilight's treehouse, but seemingly in the air, inside one of those flying crafts nonetheless. Now Spike had to find out how exactly he got here, was there a way back to his dimension, and how was he going to fit in with these mares? They looked like his friends that he's known since the birth of his life, but they looked completely different as well. S03 E09 - "Spike At Your Service"
This is the official thread for information and chatting about the ninth episode of season 3 - "Spike At Your Service"! Another Spike episode, but it also looks to be a major Applejack episode as well; so two in a row for her. The episode airs at (9:30am Central/10:30am Eastern on December 29nd). This thread will not be locked and thus commenting is open as soon as you see this; remember though, there are spoilers in the comments section so read at your own risk if you haven't seen the episode! License to burn! Happy New Year! This may have been proposed before, but I had an interesting thought about what you might call the species of such a hybrid. Particularly if this has happened before with other Dragon/Unicorn pairings, and especially of the offspring of such pairings ever found each other and 'breed true'. I.E. the kids are a true blending of the species instead of a Dischord-esque calico hodge-podge. The child of Rarity and Spike would be a Kirin. It was one of those averagely busy days in the treebary - or at least, busy for Spikes friend and mentor Twilight Sparkle, whom had left the dragon to his own devices once he'd woken up, made breakfast and tended to all of his regular morning chores. He knew she wasn't going to be venturing outside or handling any particularly difficult something or other to do that might possibly require his assistance, which left Spike at a loose end...and he was feeling JUUST a little bit restless as a result. His mind raced for things he could do on his own here, but it all seemed a bit...empty...without having Twilight to goof around with in any real way. "[colour=#008080] Hmm... [/colour]" Spike uttered to himself in thought, drumming his claws against the table he was currently sat at - a nearly finished bowl of Quartz balls sitting in front of him, which he occasionally picked at and crunched on as he pondered the days activity, or at least the direct lack of it and how he could possibly go about rectifying this fact. 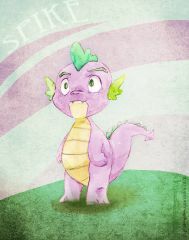 Outside, the sun was pretty darn strong, and it seemed to be giving a particularly inviting warmth...giving the youngster dragon a rather sudden urge to go boldly forth into Ponyville and discover perhaps a myriad of things that might well help to keep his inquiring dragon mind occupied for an indeterminate period of time! " [colour=#008080]Maaaybe there's something interesting going on outside... [/colour]" Spike concluded, flopping back down to the ground from his chair and making his way towards the door - for the most part, everything here was pretty much in order with regards to his normal morning chores - and there just didn't seem to be anything else he'd really need to be hanging around to do...and given Twilights considerably busy demeanour right now, he could hazard a guess she'd be like this for most of the day. "[colour=#008080] TWIIILIGHT - I'M GOING OUT FOR A WHILE[/colour]! " Spike calls to the back, hoping that the unicorn could hear him. "[colour=#008080] I'LL BE BACK SOON[/colour]! " And with that, he walks outside of the door - closing it behind him as he ventures forth into the bustle of Ponyville, in search of something to do! It was morning in Ponyville. Spike let out a full stretch the moment he awoke. This is when he noticed something was not right. For one thing, he felt a lot smaller than he normally did. His bedding which was rather snug for an teenaged dragon felt more like a king sized bed than a simple cot. Once he started to grow, he had to move out of Twilight's bedroom and his beloved 'doggy bed' and into the library's basement. Which was something he was never too keen on doing, but it was either the basement or he would have to find another home, and he couldn't even think about leaving Twilight. While he remembered the potion the mulberry unicorn had given him, he did not remember going to bed that night. What he did not know that his foster-mother had given him a sedative along with the transformation potion, knowing full well how painful it would have felt to have one's body quickly shift from dragon to pony. He glanced down at his new body, at least he was still purple! Feeling the desire to see how the rest of his new form looked, he started to climb out of his bed, only to tumble head first onto the hard floor, "Agh! ", he yelped. This pain was a new sensation for him as he was no longer covered in a protective coat of scales, but now the only thing that kept his skin safe was his pony fur. "This is going to take some time getting used to", he reached over to touch his cheek with his right hoof. "No fingers! How in Equestria am I gonna help Twilight when she needs me to write letters for the Princess? Oh duh! ", he thought to himself, "Twilight made me a unicorn like her! Would only make sense, I was a magical dragon, so I'll be a magical pony. ", he slowly got up from the floor and tried to walk. Before he could just place one foot in front of another, but now he had four feet to contend with. It took him some time to get used to it, he knew Twilight would forgive him if her breakfast was a little on the late side, but with a little dedication he was able to make it to a mirror. "Holy guacamole! ", he yelped as he paused to admire his reflection in the mirror. Twilight sure made him into a handsome looking pony! But something was wrong. Instead of a proud horn on his head, he wore a pair of strange, webbed purple and light green wings on his sides. This didn't make any sense! He was supposed to be an unicorn! He shrugged before giving his new pair of wings a flex, "Well, at least I'm a pony. ", he muttered to himself. As he was getting older and larger, uncomfortable urges started to fill his very being. He felt the need to horde, and his growing appetite was starting to get out of hand and while she would not admit it, he was more than a large burden on Twilight's financial situation and he hated to see Twilight worry so. Other urges started to flow, and after scaring Applejack's sheep one day, he wasn't permitted near the farm for more than a few months. And while he was still able to fulfill his appetite on pony-food and gems, he still felt the need for something a little fresher and a far more fleshier. He had considered moving out of Ponyville and back into Canterlot. The princess' probably could have used a big dragon to fight on their side against the kingdom's enemies, but he still wondered how long he would be 'Spike'. Would his mind change with his body like it did before? Would he become a monster? He flexed his wings, pumped out his chest and growled, "Why hello Rarity! Noice anything different about me? Huh? I'll give you a hint!". He waggled his eyebrows at his own reflection before turning away from the mirror and towards the stairs. The need to eat Applejack's sheep and to horde was no longer a problem for him..Getting up these stairs..Now that might be a problem. It seemed like forever, but he was able to get up the stairs and only managed to give himself a few bumps and bruises along the way. He was able to push open the door, "Hey Twilight...er..", he stopped realizing what he said, "Er..Mom? Hey mom! ", he glanced around the Golden Oaks Library, hoping his 'mother' was awake. An old Spike sprite drawn to a 4 color palette, NES-style.